What’s the number one reason people seek help and hire a professional? They believe said professional can solve their problem. We hire people to solve problems. We buy products we believe can solve our problem. With this in mind, what do you want to be known for? I dunno about you, but I want to be known as a problem solver. A problem solver can have many names, particularly in this era of overused marketing terms. Guru. Expert. Thought Leader. All of these monikers relate to the same purpose: we’re in the business of solving people’s problems. 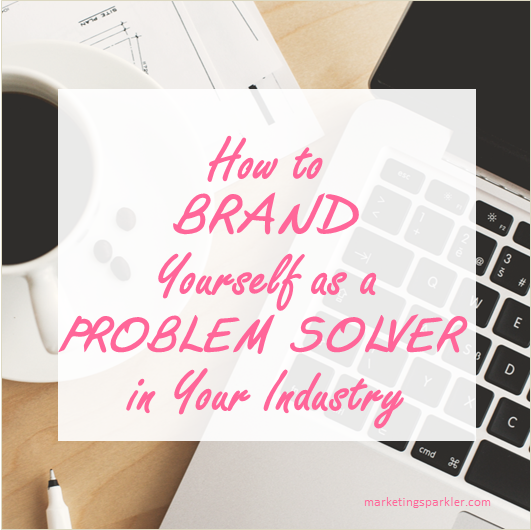 There a number of effective ways to brand yourself as a problem solver in your niche without spending a fortune on marketing. The first step is to know your niche inside and out. What do your customers want and need most? What are their pain points, that is, their most important problems that they need to solve? Customers want solutions. What problem does your product or service solve? Customers are looking for solutions. Solutions that actually work and offer good value for money. They are constantly asking the question, “What’s in it for me?” With so many websites and businesses online, you need to answer that question from the moment they show up at your website or discover one of your products online. Once you know what your niche needs, offer it to them. There are a few ways to do this. Make sure your website has information on every product and service you offer. Include a Marketplace that links to every product. Make sure your site looks professional, with an easy to use layout that is mobile-friendly. Your niche-related content must be worth taking the time to read. Just because it is free does not mean it should be junk. I repeat, don’t offer crap just because you’re offering it for free. Publishing impressive niche content regularly is a great way to brand yourself as an industry leader. Publish impressive content regularly to position yourself as an industry leader. Use your site as a lead generation tool to build your email marketing list. In this way, you can communicate with your list on regular basis, presenting your niche customers with information, products and service that will prove you know what you are talking about. The products you promote can be yours, or affiliate products you are selling for a commission. They might also be Joint Venture (JV) products you are promoting to your list in exchange for your partner promoting your items to theirs. In order to get people to sign up for a mailing list these days, you need to go beyond the free newsletter offer. Offer a compelling special report packed with information (and links to buy products) related to your niche. Create a free ecourse or video series to help subscribers meet an uber-specific goal. Aim for a specific topic most people interested in your niche will be excited to read, and even to pass on to their followers. Partnerships with JVs gives you other opportunities to show yourself as a thought leader. These include writing reviews of every product you sell as an affiliate or a partner. JVs might also invite you to take part in an online webinar or interview you as an expert in your niche. You might even get some guest blogging opportunities in which you write articles for some of the top blogs in your niche to show what you know. If you’re working to position yourself as a thought leader, you want to demonstrate your expertise. Social media is an inherently solid platform for this. You can use social media to ask questions, answer questions, and meet both key influencers and your audience. Search for people talking about the problems that you solve. Answer their questions, and secure yourself as a resident expert with solutions to their problems. Use social media as your research lab – ask and answer questions specific to your industry. This goes back to the what’s in it for me concept mentioned earlier. Why should people think you’re the expert? Why should people follow you? Why should people visit your website, sign up for your list, and buy your products and services? Because you have already shown that you understand their problems AND your products (and/or services) solve these problems! One of the best ways to give yourself instant expertise is to write a book and publish it on Amazon. This is becoming a cliche because it’s true. Your book doesn’t have to be an encyclopedia of everything you know about your niche. Make it easy to digest. Remember, humans have the attention spans of… wait somebody just tagged me on Facebook. I’m hungry. What was I saying? I remember now… attention spans, humans, three seconds. Don’t pontificate about theoretical application, write with explanations and action steps. Many bestselling books are usually ones with How To somewhere in the title, offering real solutions to your readers. Publish it as an ebook through the Kindle Digital Platform (KDP) first. If there is enough demand, publish it in paperback as well. Because, well, why not??? Becoming a thought leader/guru/expert/problem solver in your niche is easy if you give your prospects what they want and need, and show you are in the know about all the top products and services available, not just your own. People will pay you for the depth of your industry expertise, reach, and ability to find resources to do what? Say it with me now: Solve. Their. Problems. Miss Kemya is a Marketing Strategist and Social Media Manager at Marketing Sparkler, a boutique marketing firm that facilitates the growth of small businesses through offline and online marketing strategies. She provides both consulting and done for you services to brick-and-mortar businesses and digital brands alike.